Thanks to all of you who have joined us as members, participated in committees, sent in suggestions and generally made the Midtown Residents Association (MRA) a well recognized and well respected neighborhood association. This newsletter is dedicated to MRA activities and events, plus it includes more stories about Midtown folks. Events: We work to bring important city and Midtown issues to you at neighborhood meetings as well as have fun too! This is what is planned for the fourth quarter. September 14: MRA co-sponsors: What is the future of the Baylands? How can this important land best be used in the future? Council member Judy Kleinberg and Planning & Transportation Commissioner Pat Burt (individually, not speaking on behalf of the City) will introduce the discussion. On hand to answer questions will be specialists in playfield space, golf course design, housing and flood control. The forum will be held on Tuesday, 9/14 from 7:00 - 9:00 PM at the Palo Alto Golf Course Clubhouse Conference Room, 1875 Embarcadero Road. This is an important conversation for our Midtown neighborhood, since we are one of the two closest neighborhoods to this area. September 18: MRA co-sponsors: Day of Emergency Preparation: Midtown along with other south Palo Alto Neighborhoods, the Red Cross and the YMCA will co-sponsor an important Emergency Preparation community meeting. Responses from past MRA surveys indicated this was a topic that most of us were interested in! It will be held on Saturday September 18 at 10:30 AM at the YMCA at 3412 Ross Road. An exciting program is planned with dynamic keynote speakers from the Police Department - Torin Fischer, Captain, and Ken Dueker, Reserve Officer, who teaches this topic in the Citizens Police Academy. This is a must attend event. To make it worth your while, we are soliciting questions ahead of time. These questions will answered at the presentation and Q&A will be distributed in hard copy. Please forward any questions to Katie Hubner at khubner@paarc.org or 688-0422 at the Red Cross Office. Katie will collect the responses and prepare a Questions and Answers sheet. Additionally a special session of "Together We Prepare for Kids" will be held from 1-2 PM. Simply setting aside food and water is only part of the story. Come and encourage your friends and neighbors to attend the presentation. They will learn the answers to their questions as well as a range of precautions they can take that will save them from difficulty and stress in the event of a natural or man-made disaster. September 19: Workday at Midtown Garden, 3 - 6 PM. Get to know the garden and help celebrate the start of autumn. September 22: Chamber Business Mixer at Midtown Center. 5:30 - 7:00 PM. Entrance fee $5.00. Food, Drink, Prizes, as well as a grand raffle. Come meet our merchants! Event will be held next to the Poetry Wall. October 3: Fifth Annual Ice Cream & Issues Social. Hoover Park Sunday October 3rd 1:00 PM until 4 PM. Join the Midtown Steering Committee on a lazy afternoon. Ice cream, waters, appetizers will be provided compliments of our Midtown Merchants. Score will once again do their magic face painting. This year, our school liaison committee will have games/competition for kids. Local issues will be school parcel tax, environmental service center and libraries. November 9: TENTATIVE DATE: Meet the City of Palo Alto Managers - Join us on Tuesday November 9 at 7:15 PM at Friends Meeting Hall, 957 Colorado. Come and hear key City of Palo Alto Department Heads talk about what their department does, what their biggest challenge is, and their vision for their department. Featuring Lynne Johnson, Police Chief; Glenn Roberts, Public Works; and John Ulrich, Director of City Utilities. MIDTOWN - People define our history… a continuing story…Places are just dots on the map until we connect them with the people who bring them to life and give them significance. In our series on notable people in the MRA News, we connect these people to the places we pass every day and show how our neighborhood has evolved. 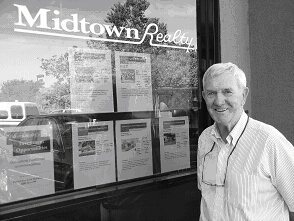 It's hard to believe, but Tom Foy wasn't always the man behind Midtown Realty. He wasn't even a Native Californian, but came west via Naugatuck, CT, Officer's Candidate School (OCS) and Ft. Lewis and a stint as a technical writer for IBM. Even though the Midtown building, at the corner of Middlefield and Colorado, had been under water in the 1955 flood, wife Patricia liked the neighborhood and she and Tom moved to Palo Alto in 1959, choosing its charm and diversity over towns further south, like Los Gatos. Tom coached the various AYSO soccer teams of his six kids for over 19 years and helped establish the CYSA in town as well. Tom remembers the engineers from Lockheed who would roll a marble across the floor to test for levelness or take out a magnet to check for the legendary copper versus steel pipes in the radiant heat system of the Eichlers. He points out that the cul du sac by Sycamore boasts larger lots than most in the area with a 30 foot setback for the abandoned creek, which had its old creek bed filled in and diverted in the 1960's. 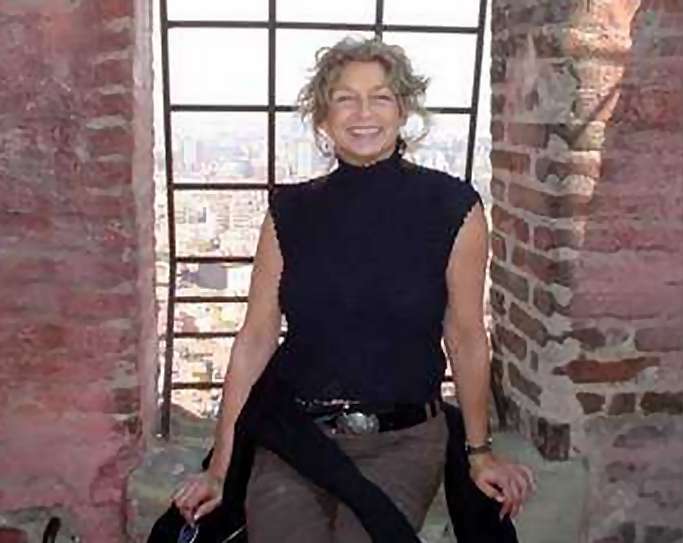 During the economic slowdown in the 1990's, Midtown Center had its share of vacancies, but Tom encouraged the merchants and property owners to bring in a resource person, Suzanne Shields who helped bring in new tenants and brighten up the area. Midtown was able to avoid the doldrums which have hit the nearby Alma and Edgewood neighborhood shopping centers. Anne Cribbs is a true American hero. And better yet, she is a Bay Area hero. And lucky for us, Anne makes her home in Palo Alto's Midtown. Anne learned how to swim at the ripe age of 4. One of her early swimming coaches told her that he barely missed participating in the 1952 Helsinki Olympics. From that moment on, Anne's dream was to compete in the Olympic games. By the time she was 15 years old, Anne achieved her goal. At the 1960 Olympic games, Anne and her teammates won the gold medal for the 400 meter medley relay and she placed 5th in the world in the 200 meters breast stroke. Because of the preferential treatment of male athletes in 1960, the U.S. men's swimming team was invited to tour Europe, but the women's team had to return home. At home, Anne stopped competitive swimming because at that time there was no women's swim team at the college of her choice, Stanford University. Unbeknownst to Anne at the time, experiencing the inequities between the treatment of male and female athletes, even at the world class level, helped shape her current perspectives. Anne is always at the forefront of issues regarding the equal opportunity for women in sports. Anne pursued a couple of careers in the area of recreation. Over the years, she has taught many, many peninsula children how to swim. She also worked tirelessly for the City of Palo Alto in the Community Services Department. Several of the now famous Palo Alto events were invented on Anne's watch. The Black and White Ball was just one example of Anne's exciting ideas. She is currently serving as a City Council appointed member of the Parks and Recreation Commission. Anne has another great ideal! In the spirit of fitness, Anne wants to jump start a campaign promoting community walking by having elected and appointed officials wear pedometers that are linked to a computer that indicates distance traveled, calories burned to date. Using city officials as role models, Anne anticipates that the value of fitness will permeate Palo Alto. Recently, when Anne combined her love of sports with her organizing skills, she and several partners developed a bid proposing the Bay Area as a future Olympic venue. The momentum was contagious and the supporting network was world class. 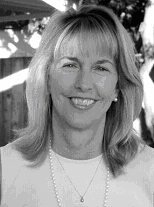 As president of Anne Cribbs and Company, Anne is currently leading the Bay Area Senior Olympic Committee (BASOC) in their quest to get the Senior (50+) Olympic Games here in our backyard. Anne's mantra states that "Olympians are indeed ordinary people who achieve extraordinary things, because they believe they can. The reason for their success is no secret they love what they do, they have dreams and they never give up". Midtown's own Olympian and regional hero, Anne Cribbs, certainly lives by those words. The pants were two sizes too small in the waist although they otherwise fit and the jacket fit just right. She would have thought the outfit was a lost cause. It was an expensive designer pantsuit not returnable. To Elaine Goldman the problem was a "no brainer." She took one look at the pants, turned them inside out with practiced ease and said, "No problem. I'll just take a little fabric from inside the pockets and move it to the waist, then replace the pocket material inside. It won't show anyway." And it didn't. No one would ever know the pants had been altered - or ever touched. That is the magic of Elaine's Perfect Fit. The pants fit perfectly. For this French Fashion Academy graduate who started as stylist to a New York fashion photographer, fixing the pants was not a challenge. She is a master in the art of fabrics: design, quality fabrication, and selecting the best fabric for a garment. From her home in New York, to a farm in Arkansas where Elaine and her late husband Bill Goldman grew blueberries, raised livestock and lived off their farm, to Midtown Palo Alto where she began her dressmaking and alterations business in 1981, Elaine has been an institution to many of Silicon Valley's most famous Bay Area women and men, including making a maternity dress for Princess Di and a wedding dress for many Silicon Valley moguls. Being the stylist for the photographer and shopping for everything for the photography shot is what lead Elaine into her profession in the first place. She could never find what she wanted marching up and down the streets of Manhattan. She passed the Academy on Madison Avenue several times. Finally she decided she would begin to learn to make her own cloths even if she couldn't find everything. She laughs when she talks about the differences between New York clients and California clients. Elaine says New Yorkers are always in a big hurry and they don't have time to "bond" with you. "New Yorkers read you," she said. If they like you well enough, then you do business, and they are gone." Some Californian's want references and are very suspicious. They take forever. Normally I don't usually have any problems. After all, I've been in business here for 25 years. Elaine says her business has changed over the years in that more and more women have adopted the European habit of having a dressmaker (couturier) on hand to make the tiny adjustments on the clothes they buy or make that special blouse or add those buttons that add the touch to the garment that sets it off. People didn't do that years ago, but she sees it more now. "Fifteen years ago people thought of me more just for the special occasion or wedding dress. Now they come to me for all kinds of odds and ends and to fix clothes they have bought off the rack." Many of Elaine's clients have been with her for 25 years and are her long time friends. They have been with her through raising her children and when her husband, Bill, died two years ago. Elaine and Bill raised their four daughters in Palo Alto and have been involved in Midtown Palo Alto community for over 20 years. Elaine is a Midtown institution on Middlefield Road for 25 years. Her face is familiar at all the Midtown establishments, as Elaine believes in shopping locally. She also supports one of the garden plots behind the Palo Alto Café and donates fruits and vegetables that she doesn't cook up herself. Elaine's services range from custom clothing where she will create and design any garment in any fabric from a photo or sketch or from a clients specifications. She does alterations for men and women. She also works on bridal gowns, beaded gowns costumes, resizing and restyling. Elaine is a personal shopper, and provides trunk shows representing French Rags, semi-custom designer knits made from Belgian yarn. She is a consultant for Doncaster, (sizes 2-18) and elyna sizes (12-24). She is also a consultant for Jeannette Miner who brings her collections from Paris twice a year. If this were not enough, Elaine will also help her clients with wardrobe and closet organizing, as well as facilitate culling and alternative wardrobe options. Elaine works out of her home studio, so she is available to the time stressed working professional. She can be reached at 650/493-1433 or www.elainesofpaloalto.com . When are our local restaurants open? What churches or synagogues are nearby? What are the local activities for kids? Find the answers to these questions and more on the Visit Midtown Businesses link on the Midtown web site. You'll find the types of stores along with their hours, phone numbers, managers, emails, and web sites. SHOP MIDTOWN! The Midtown Residents Association's (MRA) program "Welcome New Residents to Midtown" is up and running and has been well received. This new program is a version of the old welcome wagon; we deliver baskets of merchant coupons and information - for Midtown, City of Palo Alto and Emergency Preparedness - to new Midtown households. To date, the committee has delivered Welcome Baskets containing information, gift items and discounts (contributed by Midtown businesses) to over 60 new households. Our next welcome wave will be in September to approximately 20 more new households. MRA looks forward to continuing to support our community. For questions, contact Phil Mader, Senior Project Manager, Prometheus Real Estate Group, Inc. in Redwood City at 596-5345 or pmader@prometheusreg.com. I've been asked to discuss Palo Alto's current finances, a topic that always engenders much discussion amongst Palo Altans. I'll segment my comments into two areas - what are our current revenues and the choices we make in spending our funds. Palo Alto has been fortunate to have a diverse revenue stream. We get funds from the typical sources (sales tax, property tax, hotel tax, etc.) but also from unusual sources, such as a utility users tax, entrepreneurial services we sell to other cities and, of course, utilities fund transfers. Currently, Palo Alto's General Fund revenues are expected to be $102M. Though, unlike many cities, we have a multitude of funding sources, it doesn't mean we are recession resistant. Over the last five years Palo Alto revenues have decreased by 7%, or about $8M. Key revenue loses are sales and hotel taxes. If the current economic environment persists Palo Altans and the City Council may have to make some tough service decisions. Retaining revenues and prioritizing services will be come very important, as will diligently manage our resources. This is why efforts like Mayor Beecham's to retain auto services and provide a friendlier business climate are critical, if Palo Alto is to remain a special, vibrant community. Courtesy of the Palo Alto Historical Association and excerpted from the booklet "Parks of Palo Alto"
Herbert Hoover Park (2901 Cowper - Area: 4.2 acres) owes its existence as well as its name to Hoover School which is no longer adjacent. It has been relocated to Barron Avenue. The school predated the neighborhood park by several years; now it is the park that is outlasting the school. The park is named for Herbert Clark Hoover (1874-1964), thirty-first President of the United States (1929 1933). Herbert Hoover's ties with Stanford University were lifelong and in August 1949, he was made an honorary citizen of Palo Alto. He entered Stanford in 1891, graduated as a member the 1895 Pioneer Class, was the second alumnus to be elected to the Stanford Board of Trustees, founded the Hoover Institution in 1918 with a $50,000 grant, proposed the creation of a Graduate School of Business in 1924, and in 1928 accepted the Republican nomination for President of the United States in a speech delivered at Stanford Stadium. He made his home on the campus; it is now the residence of the President of Stanford. The elementary school opened in 1926 with two rooms and was called South Palo Alto School. By 1949, it had grown to fourteen classrooms with an enrollment of 500. In July 1950, the school was renamed Herbert Hoover School. In July 1954, the PTA Board sent letters to the City Council recommending that adjacent land be purchased for a recreation park, and later that year the City Council gave its approval. The site was bought in 1955 for $26,000 and covered 2.6 acres to which 3/4 of an acre was added in 1957. This was one in a series of parks financed by a 1956 bond issue. Before the park development was completed in 1959, a citizens' committee protested the size of the park as being "totally inadequate" because of the felt need for an older children's play area and tennis courts. Four more parcels were acquired and in 1970, a two-phase master plan for improvements was approved by the City Council. Hoover School closed its doors in 1971, but reopened in 1974 as an alternative "structured" school that was subsequently moved to a Barron Avenue site in 1982. Residents were reassured that the school closure would not affect the park. In fact, the city acquired from the Palo Alto Unified School District an additional acre to be added to the park. In a relatively small area, Hoover Park manages to offer many facilities. The tiny tot area has four crawl through pipes, a merry go round, swings, a climbing tower, 2 slide, and two sand pits. The apparatus play area boasts a geodesic dome to ascend, more swings, and a roller coaster slide. In addition, there are two tennis courts, two handball courts, a tennis backboard, a softball field, two picnic areas, and two fenced dog exercise run alongside Matadero Creek. An original feature is a dry watercourse bed made up of pebbles set in concrete with boulders at intervals for visual effect. Water used to be directed through it, creating a wading creek, but this feature was discontinued during the 1976 drought as the water could not be recycled. Many Midtown Residents live alone for a variety of reasons the children are grown, your husband is traveling, you are in between roommates. You work during the day, you see neighbors when you are out walking the dog. You aren't REALLY alone. But, what if at 11 PM, you start feeling chest pains? It is probably just heartburn from the leftover lasagna and sausage, but the pain doesn't go away, even after a half dozen antiacid tablets. You start to feel clammy and your heart seems to be racing; this is scary, but calling an ambulance, calling 911? That seems even scarier. And if you do call 911, who is going to go with you to the hospital and hold your hand, help you fill out the paperwork and make sure you get what you need as soon as you can? What you need is a friend you feel safe calling - even at 11 PM and even if you aren't sure you have heartburn or a heart attack. And, you need to ask that friend if you can call them before you have the next leftover lasagna or wave of heartburn or heart attack scare. Have a conversation with that friend down the street about doing a buddy exchange. You can call them for an emergency - at any hour - and they can call you. Now, what if you weren't really having a heart attack and that pain the chest, clammy skin and thumping heart were just a combination of heartburn and nerves? You get to the hospital and it turns out to be a false alarm. You roused your friend from bed to drive you to the Emergency Room for no reason. Not to worry. Your friend is your friend. They will be glad that they can be there for you when you are ill, but even happier to find that you are not. On July 26, 2004 the Midtown Traffic Committee met with Chief Transportation Official Joseph Kott to review the impact of the new traffic signal and traffic flow along Middlefield Road, and to discuss the next steps by the Transportation Division to evaluate the impact. What seems to be working -- The general impressions about the impact of the Middlefield/Bryson traffic light were positive. Everyone agreed that it increased safety for both vehicles and pedestrians. Traffic flow on Middlefield is much smoother because of the new left turn lanes. Some areas of concern -- There is ongoing concern about safety for bicyclists, especially casual riders. Of particular worry is Middlefield between Colorado and Marion. All agreed that it was dangerous for bikes to use the road, and that sidewalk use was not an ideal alternative. Alternatives were discussed with no solid resolution. Additional concerns include pedestrians and bicyclists crossing the driveway into Longs when the exiting traffic has a green light and the on-going problem of people turning into the exit driveway as a shortcut to the café area. Also discussed were complaints about delivery trucks using Colorado to reach Safeway and other stores at Midtown. This is against local code, which the Palo Alto Police enforce. How you can help -- The city will be gathering traffic statistics and Joe Kott asked for volunteers to assist. All Traffic Committee members volunteered and would like anyone who is interested in helping to contact Sheri Furman at sheri11@earthlink.net. The plan is to have 2-person teams spend an hour monitoring specific points. The monitoring would occur at various times of the day to include traffic from rush hour, normal shopping, and end of the school day. David Stillman, Senior Traffic Engineer, who designed the project and made it a reality, will coordinate the effort. If you are not receiving enews updates about events of importance to Midtown, and you would like to, just send your email address, name and phone to MidtownNews@att.net. If your email has changed, let us know. Send your new address to our editor at MidtownNews@ATT.net. Midtown Residents Association is staffed by volunteers, and we do a lot with a little. But we need a little money from time to time to put out mailings, fliers, etc. Our regular dues are only $10/year. If you're not a current supporting member, please become one. If you already have your annual support in, we thank you; but if you want to donate a little extra, that would be very appreciated. Every adult living in Midtown is a member of the Midtown Residents Association (MRA). You benefit from the activities and information that MRA provides. There's enews, the newsletter, the Ice Cream Social (next one is Sunday, October 3), the general meetings (remember the one on" Identity Theft" by our Palo Alto Police Chief), and co-sponsored meetings (e.g. the emergency preparedness, council candidates). We encourage you to let us know of any developments or issues in Midtown where MRA can play an advocacy role. Please let us know if there are events, awards, recognition or "bit of news" that you would like to publicize If you want to be more involved and have questions, call Annette Ashton 321-1280. Please note the date on your label on this hard copy newsletter is the date you last paid or sent a check. To join or renew online: go to our web site www.MidtownResidents.org and click the left icon "Become a Member". If by check: please make your check out to MRA, and send to our treasurer, Sylvia Gartner, at 824 Moreno, Palo Alto, 94303. September 12: Safeway noon till 2 PM, talk with Council members Freeman and Kishimoto at their "Sidewalk Office". September 14 - What is the future of the Baylands? How can this important land best be used in the future? Panel Discussion includes Judy Kleinberg, & Pat Burt. Palo Alto Golf Course, Club Conference Room; 7:00 PM. September 18 - 10:30 AM "Are You Prepared?" A day of emergency preparation tips. Ross Road YMCA. See details inside. September 19 - 3 - 6 PM, workday at Midtown Garden. Get to know the garden and help celebrate the start of autumn. September 22 - Chamber of Commerce Mixer. Midtown Center near the poetry wall; starts at 5:30PM. October 23 - Harvest Festival, Ohlone School, 950 Amarillo Avenue, 1 PM to 5 PM, Food - Live Music - Games - Crafts and MORE! Proceeds benefit the farm at Ohlone School. November 9 - TENTATIVE DATE: Meet City Managers and hear about their departments, their vision, their challenges. 7:15 PM, Friends Meeting Hall, 957 Colorado.